It’s been a hectic day, but I think we will pull the anchor, head over to the shipping pier, load up on diesel, and leave Kavieng within the next hour. We’ll stop a night or two in the Hermit Islands, and then head to Jayapura, Indonesia. The day started early. Jenna, Lauren and I were all up at 6:30 this morning. It looked like a sunny day, so I spent 20 minutes re-hanging damp laundry, blankets, sheets, and mattresses outside. Leo had left his hatch open the other day, and by the time we discovered it there was an inch of water on his cabin floor. With all the rain over the last 48 hours, it was impossible to dry out. Today started sunny, so we had a shot. At 7:30, Jenna, Leo, and I went into town for errands. Jenna headed to the market for fresh produce. Leo and I went to the DHL office for our package. It wasn’t there, but the DHL dude was heading to the airport in their pickup and would hopefully grab it. Leo and I then went to Customs so we could clear out of the country. When we got there, the door was locked. Eventually the local manager showed up, unlocked the door, and apologized, saying he couldn’t do anything because the power was out all over town. Perhaps we could come back later? We hung out for a bit more, and then the 2 women who worked there whom we had dealt with earlier in the week arrived. One gave me my form for getting duty free fuel. She said we would have to come back when power was on before we could get our clearance. We took a photo of them with Leo (above.) The one in the red shirt is very nice. She is an intern there, and her middle name is Seattle. She doesn’t know why her dad named her that. 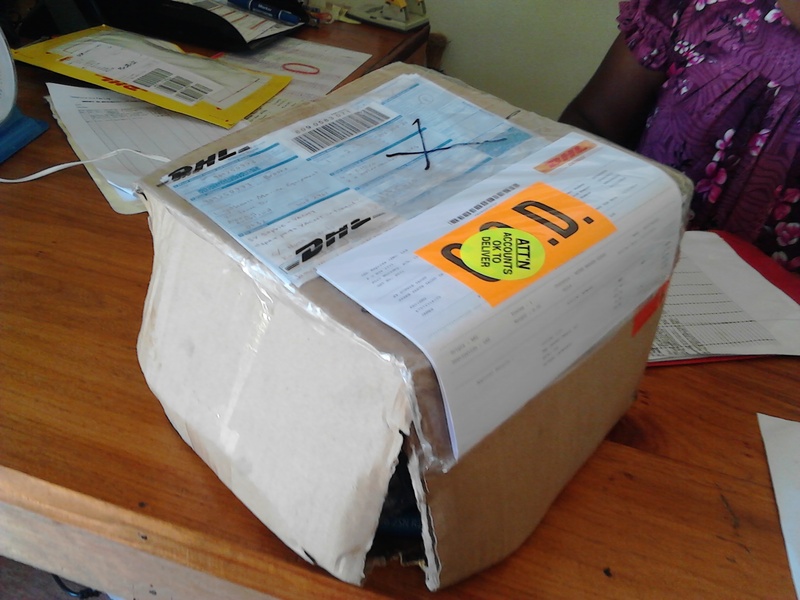 It took just one week to ship this box from New Zealand to remote Papua New Guinea. I was very happy. Next Leo and I went to Hardware Haus (this part of NewGuinea used to be owned by Germany) and bought two 5 gallon gasoline cans. We can only buy fuel in 200 liter drums, and we decided to buy 4 drums. We liked the idea of having a little reserve just in case we don’t have room for 800 liters in our main tanks. Besides, our friends on Per Ardua left 2 days ago and are low on fuel. We might bring them some. It’s what motherships do. Next, Leo and I called Jenna on the VHF and requested a pickup on the beach. 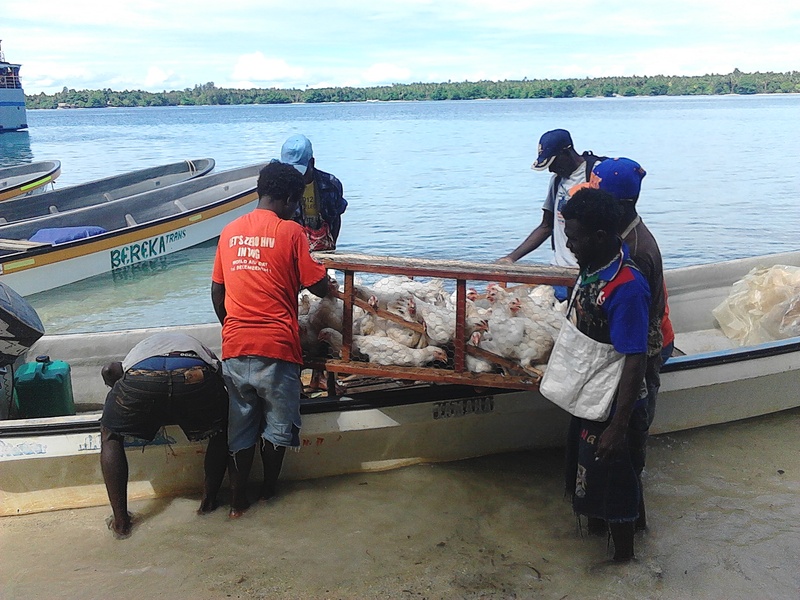 While we were waiting, a longboat pulled up and offloaded a large crate containing 30 chickens. Stuff happens. Jenna picked us up and we returned to Sophie. I then dinghied into the commercial wharf to see if we could change our “fuel bunkering appointment” from 10:00 AM to 1:00 PM. Daniel, the local manager, sat me down in his office and spent 15 minutes calculating our fuel bunkering charge. He finally came up with an answer: $93.80 kina (~$US30). He also requested that we come at 1:30 so that we don’t cut into their lunch break. I then paid him and crossed the street to Island Petroleum to pay for our 4 drums of fuel, which they would then deliver to the commercial pier. They had said earlier in the week that they accepted credit cards, but it turned out that they only accept debit cards from the Bank of the South Pacific or Westpac. We have neither. So Jenna and I made multiple trips to the ATM to get cash for our diesel yesterday. When I got to Island Petroleum, the girl at the counter told me that I had the incorrect form to waive the GST from my diesel purchase. I needed a form from Inland Revenue, not Customs. At this point, I said “the heck with it” and bought the fuel with tax in cash. I then went back across the street to the commercial wharf, grabbed the dinghy, and raced into town in order to get to Customs before they went on their lunch break. I made it there by 11:30. 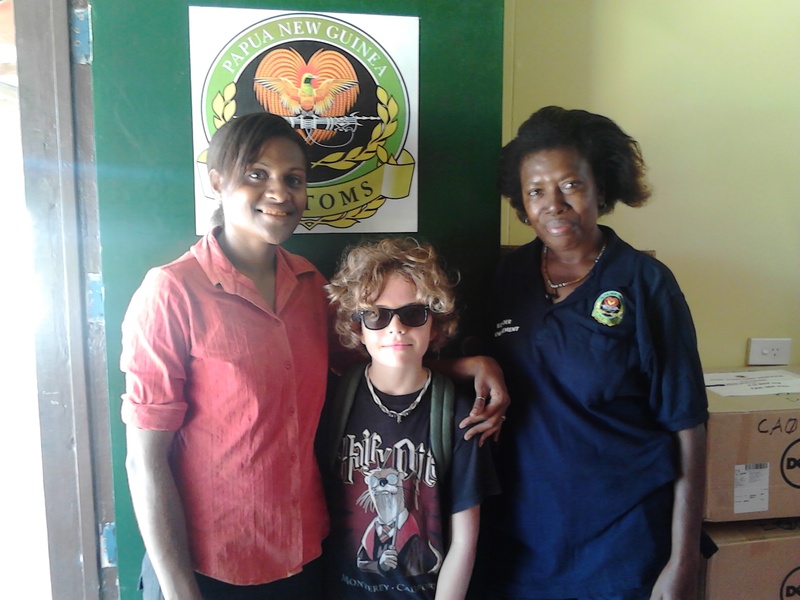 The woman above in the blue shirt was there, and she very quickly stamped our passports and gave me our yacht clearance papers for PNG. At this point I was pretty hungry, so I swung into the Kavieng Hotel bar for a very quick cheeseburger and beer. I then went back by Joe Tong’s for a bag of onions, and in our shared desire to spend all of our kina while we were in PNG, bought a case and a half of beer at Joe Tong’s Discount Liquor Window. I then got back to Sophie. It was 12:15. While I was in town, everyone else put away all of the hanging laundry, reassembled Leo’s room, started Sophie school, and got the boat ready for passage. It then started to rain.